Power Bank Golf Power Bank-Golf Portable Mobile charger For Handy Portable Charging. 6000Mhz Two Mobile Connectivity(C...Power Bank-Golf Portable Mobile charger For Handy Portable Charging. 6000Mhz Two Mobile Connectivity(Charging) at A time Device Supported for I-Phone, I-Pad, Samsung, Digital Camera, etc. Adidas Sports T-Shirts We are competent trader, supplier and exporter of a range of Adidas Sports T-Shirts in Kowloon, Hong Kong, Hong Kong S.A.R. The offered Adidas Sports T-Shirts are h...We are competent trader, supplier and exporter of a range of Adidas Sports T-Shirts in Kowloon, Hong Kong, Hong Kong S.A.R. The offered Adidas Sports T-Shirts are highly preferred in different sports. Comfortable and stylish sport tees are available in different designs, colors and sizes. Seater Golf Cart Golf Cart can be used for factory, in clubs, resorts , hotels, party venues etc.These are made by high grade of material. Cl...Golf Cart can be used for factory, in clubs, resorts , hotels, party venues etc.These are made by high grade of material. Client purchase these at reasonable rate.Seater Golf Cart .Curtis Controller Off White Colour . INDIA INTERNANTIONAL GOLF & TENNIS PVT. LTD.
TOUCH STONE ENTERPRISES PVT. LTD.
Ingersoll-Rand Technologies & Services Pvt. Ltd. Golf is an outdoor game for one or more players, each of whom uses specially designed clubs to propel a small, hardball over a field of play known as a course or links. The object of the game is to sink the ball in each of 18 holes, using as few strokes as possible. The rules of play are numerous and complex and include a code of etiquette for behaviour on the course. There are evidences that, people had been playing ball games with a club or stick for a very long period in the history of mankind. These club and ball games have been origin of many modern sports. The birth of the modern sport Golf can be traced back to such a club and ball game. Today Golf has become seemingly popular and still promises to see a great future in the years to come. Although Golf became popular in the recent past, its birth was somewhere back in 1497 in Europe. After which it saw many changes not only with the rules and methodologies of the game but also with the modifications in the golfing accessories. Some people have trace Golf back to a Roman game called Paganica. The Romans, occupied most of the island of Great Britain from the A.D. 40s to the early 400s, played paganica in the streets with a bent stick and a leather ball stuffed with feathers. Other historians trace Golf to a Dutch game called het kolven, a French and Belgian game called chole, a French game called jeu de mail, and an English game called cambuca. But most believe Golf probably developed into the game as we know it in Scotland. 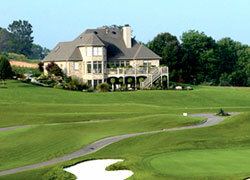 Edinburgh, Scotland, is often recognized as the first organized Golf club. It was established in 1744 and set down the first written rules of the game. These rules were developed to govern play and settle disputes. 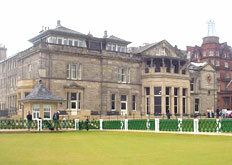 The Royal and Ancient Golf Club of St. Andrews was founded in 1754. It was the leader in setting Golf's rules and standards. For example, it set the standard round of Golf at 18 holes. Golfers played with a leather-covered ball stuffed with feathers, called the feathery, until the gutty was introduced in 1848. The gutty was a solid ball made of a rubbery substance called gutta-percha. The gutty was later replaced by the rubber-cored ball invented in 1898 by US golfer Coburn Haskell. Historians trace 'colf' back to December 26, 1297, in the town of Loenen aan de Vecht in northern Holland. On that day, the local townsfolk played four 'holes' of the game to commemorate the relieving of the Kronenburg Castle exactly one year before. The fact that 'colf' was chosen to mark the occasion is proof that the game was already popular by that time, although no one could say for how long. 'Colfer,' or golfers, were a common sight in contemporary Dutch artworks, suggesting their popularity then. 'Colf' continued until the early 18th century when it suddenly fell out of fashion, to be replaced in Holland by 'kolf,' a considerably shorter game played on a course only 25 yards in length. The ball was large, about the size of a baseball, and struck to a post set at either end of the field. The object was to knock the ball from one end to the other, hit the post, and leave the ball as near to the surrounding wall as possible. The theory of â€˜colfâ€™ eventually giving way to Golf is supported by the frequent trading links between Holland and Scotland from medieval time. The game of â€˜colfâ€™ is believed to have traveled from east to west, across the North Sea. â€˜Het kolvenâ€™ was played in the Holland and the Low Countries. It was played in open spaces and the player had to drive a ball a good distance, aiming at goal â€“ a door or a tree, perhaps. Het kolven was played in the American colonies as early as 1657. Scotland: Scotland is considered the birthplace of Golf, with the sport dating back to the 15th century. In 1457 the sport was briefly banned by King James II because it distracted from the training of military personnel. After the Treaty of Glasgow, the ban was lifted and King James IV is said to have purchased some of the first Golf clubs in the country. The legendary Old Course at St. Andrews is said to have inspired many modern traditions in Golf course design. The St. Andrews course initially featured 22 holes, which were trimmed down to 18 holes over time. Even the diameter of today's Golf course holes, four and a quarter inches, was determined by the design of the St. Andrews course. The history of Golf in Scotland is a story of innovations in course design. One of the pioneers of course design was Tom Morris, who designed many courses throughout the 19th century. In addition to being a highly successful professional golfer, Morris is also credited with creating the dogleg. He's also known for his contributions to Carnoustie, Nairn and Royal Dornoch courses in Scotland. China: In January 2006, new evidence re-invigorated the debate concerning the origins of Golf. Recent evidence unearthed by Prof. Ling Hongling of Lanzhou University in China suggests that a game similar to modern-day Golf was played in China since Southern Tang Dynasty, 500 years before Golf was first mentioned in Scotland. Dongxuan Records from the Song Dynasty describe a game called chuiwan and also include drawings. It was played with 10 clubs including a cuanbang, pubang, and shaobang, which are comparable to a driver, two-wood, and three-wood. Clubs were inlaid with jade and gold, suggesting Golf was for the wealthy. Chinese archive includes references to a Southern Tang official who asked his daughter to dig holes as a target. Ling suggested Golf was exported to Europe and then Scotland by Mongolian travellers in the late Middle Ages. (i) Early Balls: In 1452, the sale of the first Golf ball for 10 shillings ($5) was recorded. It was a feather ball made from three pieces of bull's hide stitched together. Boiled feathers were then stuffed into it. The feathers would then dry and expand, producing a a compact ball 1.5 inches in diameter. This ball called the "featherie" was said to have been much more lively than the modern balls. The featherie took hours to stuff and sew up and were therefore very expensive. This ball would have been around into the 1900s, but due to a depression in Scotland in the 1840s hardly anyone could afford to buy these balls. Wood balls were also experimented with during the early years. (ii) Gutta-Percha Ball: The most important invention in the history of Golf. After many years of attempts, the final gutta-percha ball came out in 1848. The ball was made by melting down dried gum of the Malaysian spodilla tree. It took little effort to hammer strips of coagulated tree resin into a mold and was consequently three times cheaper than the featherie, making Golf more affordable to everyone. Ball makers then discovered that if the balls had been scuffed, they would fly straighter and hung in the air longer. They then began to etch groves into the covers. Not only were these balls durable, but they were also recyclable. This ball however, was not very lively, and it did not bounce or roll well. (iii) Modern Balls: In 1898, the Haskell ball was invented and is the basis of the balls used today. It was a rubber core wrapped tightly in rubber thread and then covered with a tough rubber hide. It was much more lively than, and was dubbed the nickname "Bounding Billy." The game became easier not only because these balls flew farther, but that they were much truer in putting. They were also easier to mass produce. The wound ball is still the ball of choice on the PGA Tour. Almost every winner in 1999 played a ball containing wound rubber bands. Higher handicappers however, have switched to two-piece balls that have solid rubber cores and durable Surlyn covers. These fly much farther, but the good players prefer the soft cover with a high spin rate. Dimples arrived in 1909, claiming that the pitted shell gave the ball an added tensile strength and elasticity. The average Golf ball contains 336 dimples. There are many factors that have influenced club design. The terrain, technology, and most importantly the development of various Golf balls. Club design frequently followed new innovations in Golf balls. (i) Early Clubs (Pre-1848): In the game's pre-history, players used tree limbs or shepherd's crooks to hit a rock. The clubs in the 1600s were designed to be very upright, forcing the golfer to stand almost on top of the ball. This was due to the influence of cricket. The first dedicated Golf clubs were most likely made by shipwrights and bow makers, because of their extensive knowledge of the properties of wood. It wasn't until the 18th century that club-making began to thrive. At this time, clubs were very expensive and only royalty could afford the standard set of three clubs. These clubs were typically made by cutting a banana-shaped head out of a block of blackthorn using a bow saw. It was then joined to an ashwood shaft with fisherman's twine and a grip made of sheepskin was attached. (ii) Medieval Clubs: It wasn't until the 1800s that clubs began taking generic names. Drivers were called either a play club, with no loft, or a grassed driver, with a slight loft. Spoons, which are equivalent to irons today, had long spoons, middle spoons, short spoons, and baffling spoons. These were typically all made of wood due to the delicate nature of the feather ball. 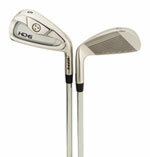 The golfer did carry three iron clubs: the driving iron, the cleek, and the bunker iron. In 1848, the gutta-percha ball was invented and is considered the most important development in the history of Golf. After this, a typical golfer would carry many more irons than woods. Club makers began using hickory for the shafts and in 1870 began using better iron due to the advent of drop forging. Cleeks were irons used for tee shots, mashies for fairway shots, and niblicks for pitch shots. There was no such thing as a matched set. Some clubs had different dimensions and weights than others. (iii) Modern Clubs: In 1926, the USGA authorized steel-shafted clubs. This brought with it many advantages. The center of gravity could now be located more nearly behind the center of the striking surface, or "sweetspot". The sand-iron, 1932, could now be developed by soldering lead onto the back of a niblick to create a wide-flange. And most importantly, the development of steel shafts allowed matched set to be made. Most people than liked to carry at least 18 clubs, until in 1936 USGA regulated this to only 14. Shafts made of aluminum and even titanium were developed, however, steel still seems to be the popular material. (iv) Notable modern breakthroughs: Perimeter weighting of the club (1960s), the investment-cast process (1960s), the metal wood (1970s), and oversized drivers (1990s). Grooves were also added to increase the backspin of the ball. Riding on the success of Indian golfers, the game of Golf has made rapid strides across the length and breadth of India. Over the years, Indian pros have consistently raised the bar in international events and the domestic tour is being organized in a professional manner. The coming of age of Indian Golf that started with Ali Sher's memorable Indian Open triumph is continuing unabated with the golfers breaking fresh grounds in distant lands. Jyoti Randhawa and Arjun Atwal topping the Asian Tour Order of Merit, Gaurav Ghei's qualification to the British Open and Atwal becoming the first millionaire out of the Asian PGA are but a few of the glorious achievements by Indian golfers. In addition to the good showing by the players, the Indian Golf Union (IGU) is making earnest efforts to improve the standard of the game in the country. In 1995, in a landmark decision, the IGU agreed to form a separate body called the Professional Golfers' Association of India (PGAI). The Early years: The British, obviously smitten by the game, took it to wherever they established their rule. The eighteenth century saw a mushrooming of Golf clubs in India. The founding of the Royal Calcutta Golf Club was followed by the now-defunct Royal Bombay Golf Club in 1842 and the Bangalore Golf Club in 1876. The Madras Gymkhana Golf Club was established in 1877, and 11 years later, Chennai got its second course in the form of the Cosmopolitan Golf Club. The Shillong Golf Club incorporated a golf course in 1886. Up north, Srinagar was the first city to have its own course somewhere in 1880s, followed by Gulmarg in 1891. While there were certain club championships which were being played in almost all the clubs at that time, the first truly national-level championship began in 1892 when the inaugural All-India Amateur Championship was staged as a strokeplay tournament at the Royal Calcutta Golf Club. The ladies were not far behind. The Ladies All-India Amateurs started in 1906 at the Royal Calcutta Golf Club with Mrs L Walker walking away with top honours in the inaugural event. The tournament has continued without interruption except for 1918 because of World War I and a gap of 10 years from 1940-50, triggered by World War II. The All-India Matchplay, for similar reasons, was not played between 1916-18 and 1939-44. Both the tournaments were dominated by the British and the first Indian to make an impression was the legendary IS Malik, who finished runner-up in 1945, '47 and '48. Formation of the Indian Golf Union: A major milestone in the history of Indian Golf was the formation of the Indian Golf Union (IGU) in 1955. A number of senior golfers realised that the time had come to establish a controlling body for Golf in this country. Until then, the Royal Calcutta Golf Club had virtually been the governing body of Golf in India, much like the Royal & Ancient of St. Andrews. The objective of the Union was to promote and maintain a high standard of Golf in the country. A special honour was accorded to the six leading clubs at that time â€“ The Royal Calcutta Golf Club, The Tollygunge Club, The Bombay Presidency Golf Club, The Delhi Golf Club, The Willingdon Sports Club and the Madras Gymkhana, who were set down in the articles as the founder members. The first President was Mr AD Vickers, who had worked untiringly to bring the Union into being and was mainly responsible for the preparation of the rules and regulations under which it was to work. The Indian Golf Union is now affiliated to the World Amateur Golf Council, and has done a great deal to promote golfing in the country. In 1957, it started its first training camp at the Royal Golf Club in Calcutta, where assistant professionals and caddies were brought from all over the country and trained to teach Golf. The All-India Amateurs, as well as the Ladies All-India Amateurs, continued to be played at the Royal Calcutta Golf Club. In 1957, IGU decided to rotate the All-India Amateurs between the RCGC, the Delhi Golf Club and the Bombay Presidency Golf Club in Mumbai. Golf is great game because it gives people of all ages the opportunity to play well. It is also a game that encourages social interaction in casual play. The evolution of equipment is intriguing. New equipment that have never been seen before is supposed to help a certain part of your game or certain people. For probably 99% of the people who play, Golf is meant to be fun. If people today had to play with the featherie and old wooden shaft clubs, they would not have as much fun because the game would be too difficult and they would get frustrated. At the same time, Golf is a game and therefore competitive. Even when played with friends in a casual match, they still keep score and want to beat the opponents. If illegal equipment is being used that gives that person a distinct advantage, it is not fair and then not as much fun to play against. Most people who are serious about Golf, play for the most part with equipment that has been approved by USGA.